I get an inappropriate amount of glee over finding a good movie I had never heard of before. It is like finding a pearl in a clam. You suspect that there might be something there, but you don’t want to get your hopes up, if just by chance there is nothing. Then, after the first five minutes of the movie, you realize that yes this movie that only a very small and select amount of people know about is actually good. Dear Murderer is another one of these pearls hidden away in a big pile of empty clams. Lee Warren comes home after a long time away in America to find that his apartment is empty and love letters lay carelessly on his wife’s dressing table. Angry beyond belief, he tracks down this lover and appears at his apartment. He forces this lover to write a going away letter but stops him before he can finish it. Mr. Warren ties him up and knocks him out with a gas contraption and then sets the scene for suicide. He is interrupted by his own wife coming into the seemingly empty apartment with yet another lover. His new plan turns into setting up this new lover as the murderer of the previous one. An investigation ensues and plot twists abound. 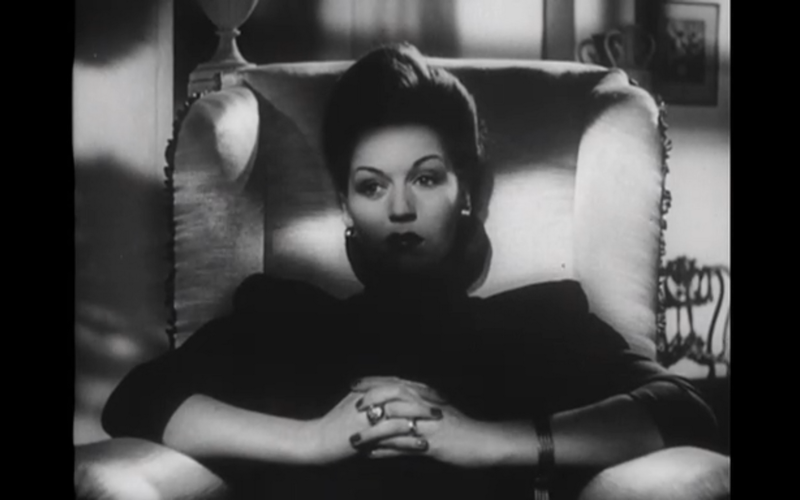 The greatest part of this movie is watching Greta Gynt vamp it up. She plays the cheating wife of Mr. Warren, Vivien. She is able to twist every man within her orbit with ease unseen in most movies. She shows no remorse when she hears that her previous lover committed suicide because of her. Instead she smiles and whispers that he killed himself because he couldn’t have her. She takes utter delight in it. Every man is helpless around her kitten like eyes and her curling smile. Even her husband who seems to hate her thoroughly at the beginning can’t help but fall for her antics once again by the end of the movie. He will believe anything to still have her in his life. Ms. Gynt was an actress I hadn’t heard of before watching this movie which is a shame. She commands the screen every time she appears with her luxurious furs drapped around magnificent gowns. Ms. Gynt was a stock actress for a production company in England during the forties and fifties, but never made it big. She never became the starlet she showed shades of in this movie. Instead she drifted off into obscurity and died an unknown widow. It is a pity that such vamping talent was wasted. She would have been a perfect vampire vixen or a slew of back stabbing wives and girlfriends, if only she was given more of a chance.